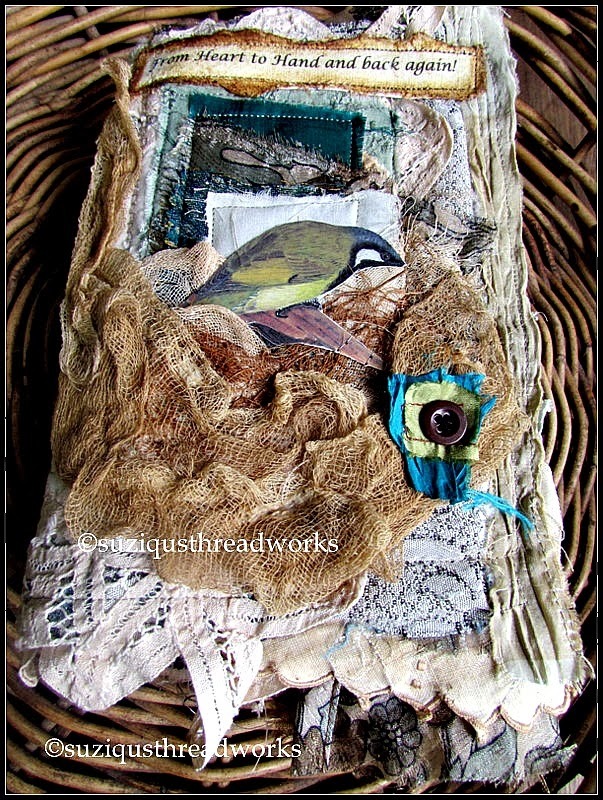 that I would share images of the Fabric Bird Journal Wrap. graces the cover perched on a branch. inside cover with placement for a pen next to it. it becomes folded into three. 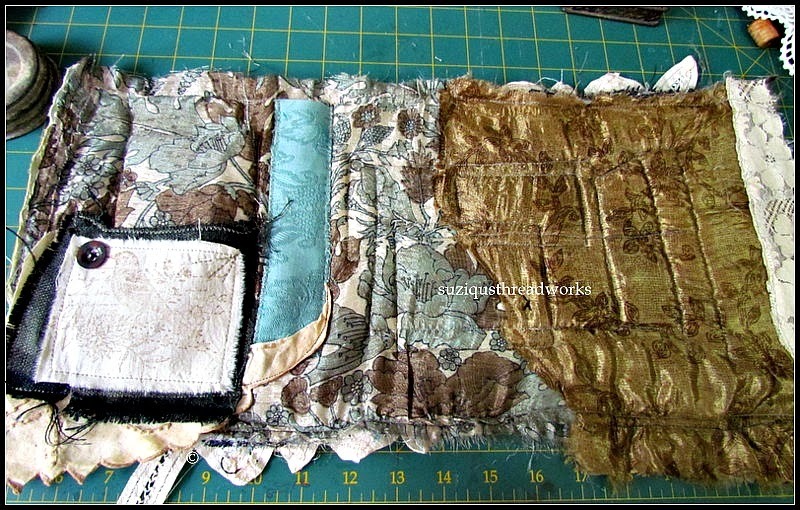 which I have sewn together then into the last fold. the second water colour page book. when it is all folded in. 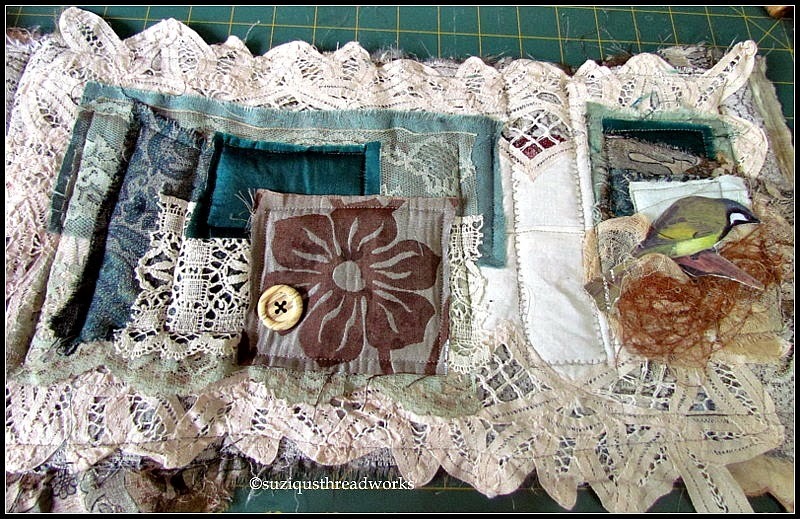 to add a piece of vintage sari ribbon to tie it all together. 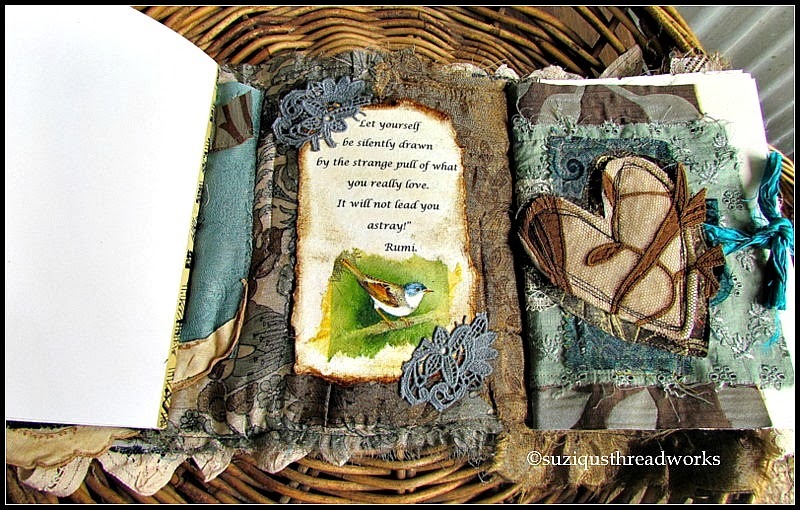 sketching, painting, scrapbooking, doodling, cookbook etc. The way you create one of these is entirely up to your own choice! My book is just one choice I can share here with you. and have a go because that's all I did! explains her way of creating one of these. Click on the link at the beginning to take you there. you can check this one out also. I reaaly love what you create, It talks to me !!! This is so beautiful!! I love your style. It is so wonderfully sort of shabby :)! The colors are great and so are the fabrics and images all together!! Thank you for sharing how you made it. I'm in wraps too :). Posted one a few days ago. Want you to know that you have inspired and encouraged me a lot !! Warm Hugs and Blessings dear Suzy! 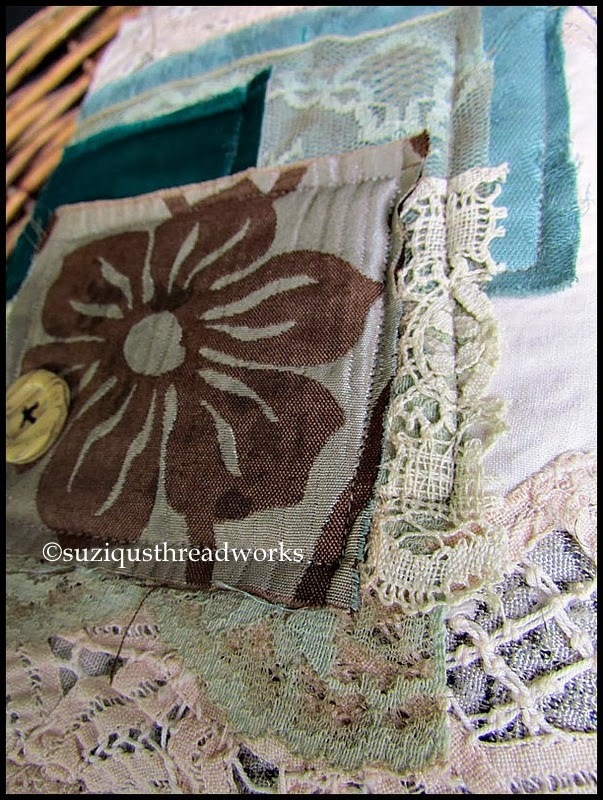 Your journals contain the most wonderful fabrics and textures - I should know since I admire mine frequently! Amazing how you make it work so beauitfully!! 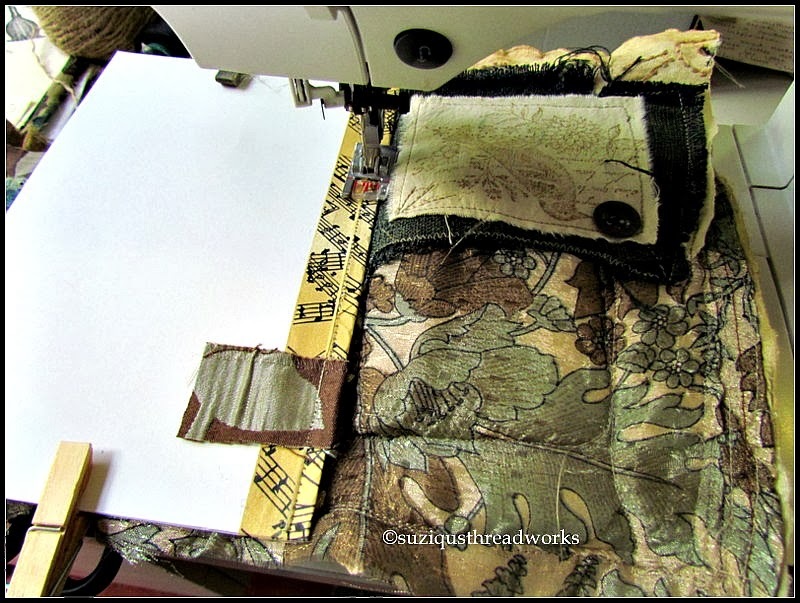 this is the most beautiful fabric book I have seen! 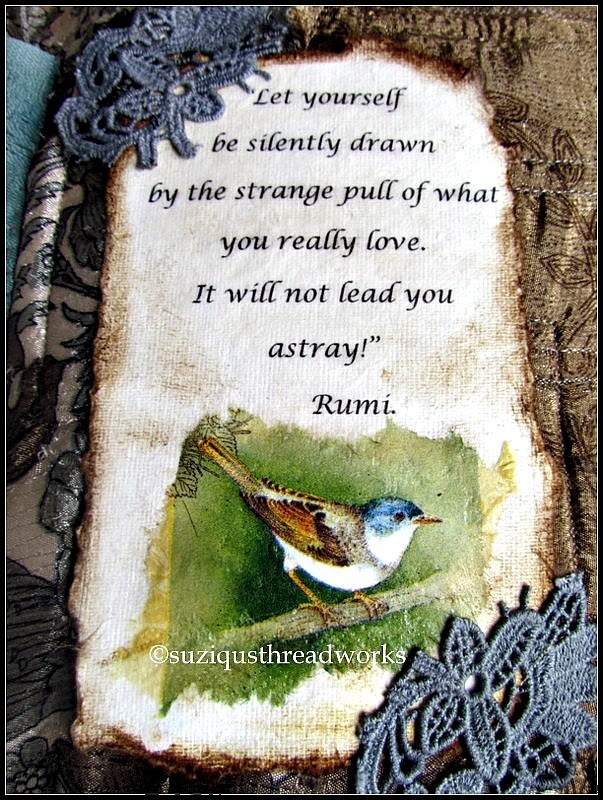 The quotes and sweet birds really resonate with me and the whole book reminds me of a gorgeous nest. What a very special book for sure. 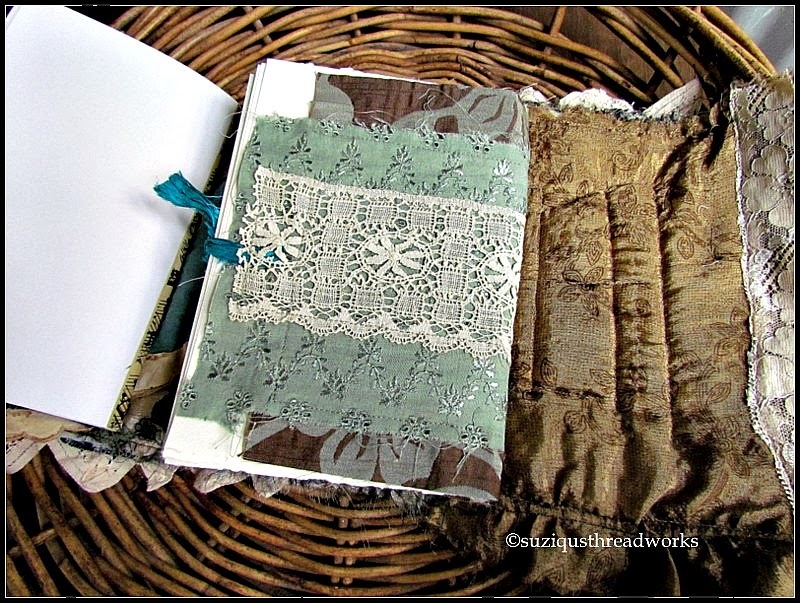 Dear Suzy your journal wrap is wonderful with all the different layers of lace, scrim and fabric, the blue color is fantastic together with the nature colors, I have had a busy time the last week with my grandsons so no time to write to you. Thanks for these explainations! Your book is really beautiful! One day I'll try, but when???? ooooh - loverly! 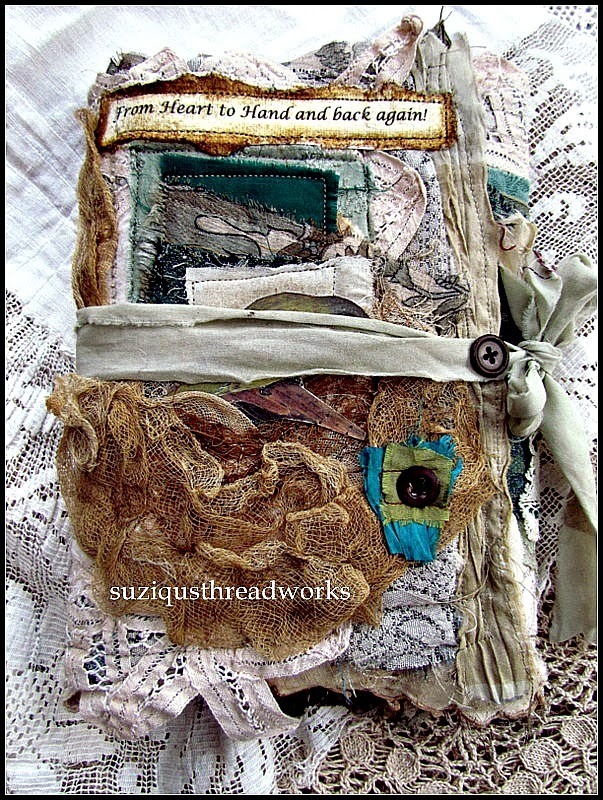 I would love to make one of these but it will have to wait until my current projects are done. Commissions before fun, unfortunately. Your birdie wrap is gorgeous! 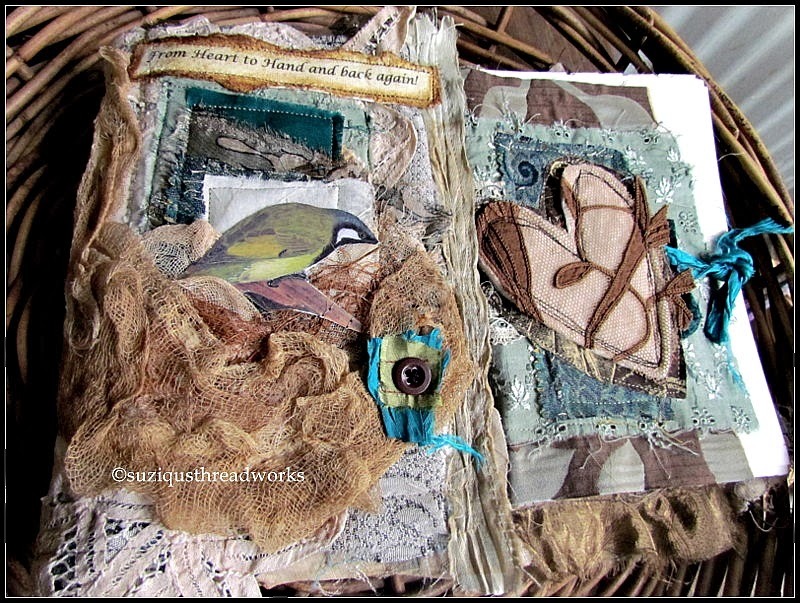 I love the bird on the cover and the way you layered your textiles. The pockets inside are so cool! This is a lovely piece of art to use every day in so many ways. What a joy to use! You did a wonderful job on it! Just lovely, I love the nest effect. 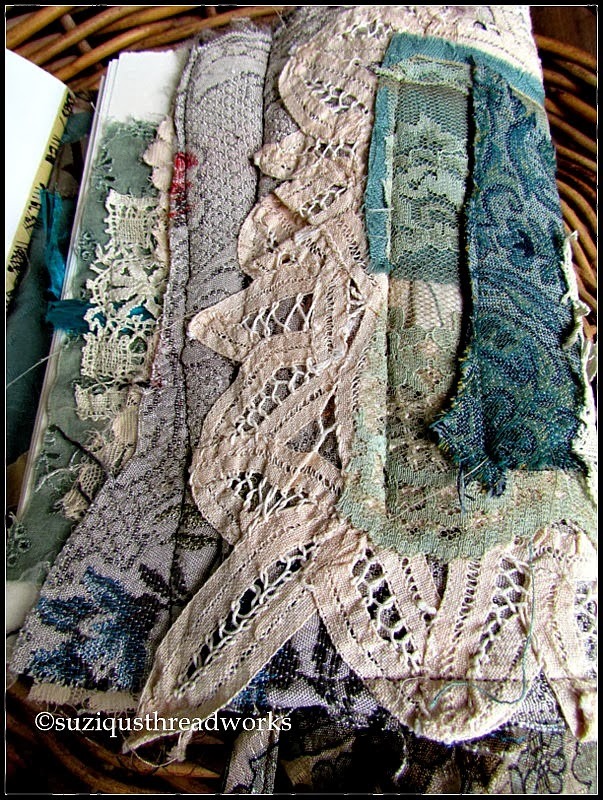 Your lace books are always stunning and I loved seeing how you do it. Thank you for the inspiration. Now, can you just please mail me some time - haha! Stunning book works. Wow, you make me wish to be able to touch them. Keep smiling and creating. Wow! Stunning craftsmanship as always. I love seeing the rich colors and texturesbin your work. So beautiful! my first time here.. I followed a suggestion and I am glad I did .. your site is gorgeeeeous! fabulous creations! I have stopped by for another visit and to wish you a Happy Birthday! 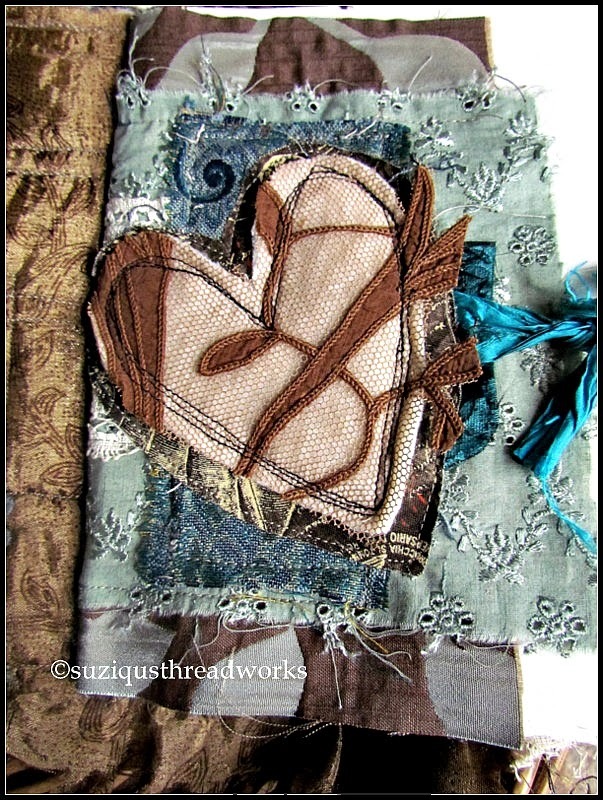 Thanks for showing the process Suzy, it is gorgeous, the textures and layers compliment each other perfectly. gorgeous laces I always spot! I love the way you have tied it with the sari ribbon too. One of these days I may have a try! This is so inspiring! Thank you sweetie for sharing with us how you made it. Everything is so gorgeous. I can see how Nellie influenced your book. I love her work, very inspiring too.